Transit (moving) Mars spends almost two months in each sign. The aspects it makes last for about four days, two days before, the day of, and the day after. 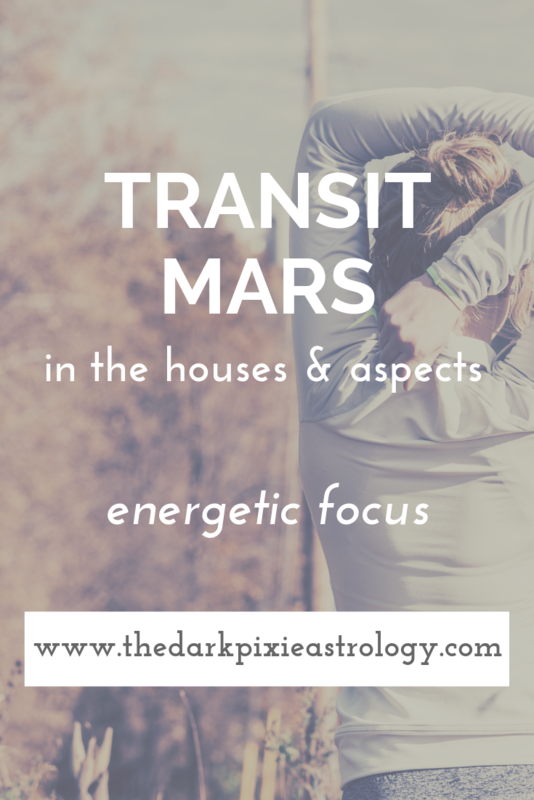 Transit Mars can show variances in your energy levels and what drives you. When transit Mars is in your 6th house, you’re driven to work. There’s a lot to do and you’re completely focused on getting every little task done. You tackle the basics first, the things that absolutely need to get done before you can do anything else, and your responsibilities. You can take on more projects and duties, and be busier during this time. You may appear scattered, but you want to be busy, otherwise the idle energy will turn into anxiousness. You could have some issues at work with your coworkers, getting into arguments with them, or have a workplace injury. This can be a great time to look for a new job. You also have more energy to tackle health issues, and can become driven to improve your lifestyle. When transit Mars is in your 9th house, you’re driven to expand your life in some way. There’s so much out there in the world for you to experience and learn about, and you want to do something new. You may dream of exploring some faraway land, and if you can travel, go for it. Most of you will likely just explore in your head, read about foreign places, try exotic cuisine, watch foreign films, or meet people from other cultures. This can be a good time to begin learning something new, take a class, or go back to school. You may feel restless if you force yourself to stick to traditional ways and your normal routine. Throw routine out of the window during this transit, and do something unexpected. Be spontaneous. Have a little thrill, no matter how small. When transit Mars is in your 10th house, you’re driven to succeed. However much success you’ve had, it’s not enough. There’s always more that you can do. Your ambition surges, and you focus on your long-term goals. You’re hard-working and can make realistic plans for how to get what you want. You may focus more on your career than anything else, which can be good for your career, and bad for everything else. It’s a good period for making strides in your career, starting a new business, or embarking on a new career path. You can be recognized for the work you do, or at least, you want to be. The more you accomplish and the more people notice, the more confident you feel. You could have issues with parents, mentors, bosses, or other authority figures. When transit Mars is in your 12th house, you’re driven to retreat and reflect. Being around other people can be draining to you right now, and you prefer being alone. Working alone is when you have the best energy, and you want to be out of the spotlight and working behind the scenes where no one will notice you. Your dreams become more prominent, and you can have some wild dreams, find yourself daydreaming more, or conversely, have trouble sleeping. Your imagination can surge, and this can be a creative time. Your intuition can surge as well, though you may not be consciously aware of that. Make sure you give yourself plenty of time to rest, replenish, and recover so you’re ready for when transit Mars enters your 1st house and life gets hectic. With transit Mars conjunct your natal Moon, super high energy is the name of the game. You’re going to need some action or you’re going to be cranky. With Mars, there’s always the chance of injury, so watch your step. Make sure you have something to do. Try not to be too impulsive. With transit Mars sextile or trine your natal Moon, your energy is still high, but you’re in better control of it and less apt to be irritable. Your emotions are strong, but you can channel the energy into something productive. Whatever you do now, you’ll do with gusto. With transit Mars square or opposite your natal Moon, your emotions may be in the extreme, especially when it comes to anger. Watch for fighting and confrontations, especially needless ones. Your hot head may get you in trouble, especially if you have a temper normally. Again, try to find a physical outlet for your frustrations (maybe time for a kickboxing class?). With transit Mars conjunct your natal Venus, your energy is higher, and you need some action, physically and sexually. You can channel the energy creatively, if you don’t have any other way to express it. You may spend money on something you shouldn’t, not thinking purchases through. With transit Mars sextile or trine your natal Venus, you can get what you want with little resistance. You’re charming, you’re in the right place at the right time, you’re sensual, and you’re creative. With transit Mars square or opposite your natal Venus, you may have a lot of energy to burn through, but not have the chance to do so. You can feel frustrated, emotionally and sexually. You may want to indulge in your senses but not be able to. You can be overly aggressive or inconsiderate of others. With transit Mars conjunct your natal Mars, you experience your Mars return, when Mars is in the exact place it was at when you were born. Your energy is high, along with your courage, confidence, and enthusiasm. You can make changes with your energy and drive that impact you over the next two years. With transit Mars sextile or trine your natal Mars, you energy is good, you feel confident and go for what you want, and you can find the drive you need to do anything. With transit Mars square or opposite your natal Mars, you may have a lo of energy that you can’t expel for some reason. You can feel restless, agitated, and out of sync. You may experience confrontations, arguments, and have a short temper. You can try too much and be impulsive, impatient, or inconsiderate. With transit Mars conjunct your natal Jupiter, you have the drive to go for what you believe in. You can take a stand and are confident. You’re optimistic, daring, assertive, and adventurous. You can expand some part of your life, are warm and friendly, and can deal with whatever’s thrown at you. You may feel lucky. With transit Mars sextile or trine your natal Jupiter, you can begin a new project, path, or idea. You’re not overly confident or unrealistic about it, and have the energy needed to make things happen. With transit Mars square or opposite your natal Jupiter, you can be overly confident or optimistic, brag, make promises you can’t keep, and overlook the little things. If you have a lot of energy, try to focus it on something productive. With transit Mars conjunct your natal Uranus, you’re very excited about something, enthusiastic and energetic, impulsive and brilliant. You want to do something new and different from anything you’ve done before. You may go a little too far when trying to break free, so pause for a moment to assess whether what you’re going to do is a good idea. With transit Mars sextile or trine your natal Uranus, you can be daring but not go overboard, and be independent but not run over anyone else’s toes. Be your original self. With transit Mars square or opposite your natal Uranus, you don’t want to be boxed in or forced to be something you’re not. Any attempts to do that will be met with fierce rebellion on your part. You can be impatient and impulsive, and you make rash decisions. With transit Mars conjunct your natal Pluto, your will is strong, and if your mind is set on something, nothing will stand in your way. You’re determined, controlling, and powerful. You can be magnetic, ambitious, or want to transform something in your life. With transit Mars sextile or trine your natal Pluto, you can control your energy and manipulate it in a way that allows you to get as much done as humanly possible. You can succeed easily, and you’re persistent and driven. With transit Mars square or opposite your natal Pluto, you want to have all of the power, but don’t feel you have enough. You can be overly controlling and dominating. You may argue with people when you feel threatened. Don’t do anything sneaky or underhanded. It’s likely that whatever you get angry over is a representation of a more important issue that you’ve been avoiding.